My research of Josef Mengele has revealed a man whose character & history of activities have been distorted & invented like no other person I can think of. WWII is a story rife with deception, many of which are impacting our lives even today. The Mengele deception is key amongst them. No Angel of Death = No Jewish Genocide. The Kazimir Tafilin escape from Auschwitz story is a good one [@ 5:00 in the video]. I found the news story its based on. Nazi commanders at Auschwitz ordered him to build a roof on one of the crematoriums used to dispose of prisoners’ bodies. They chose him for the job because, as small as Tafilin was, he could maneuver in tight spaces under the roof as he built it. As a result, Tafilin knew every inch of space under that roof — knowledge that saved his life. He escaped the camp by climbing up the inside of the crematorium’s chimney and out the top. “He peeked over the top of the chimney,” Ladny says, “and saw soldiers so he slid back down. He kept peeking until the coast was clear, then he jumped down. "Bakke: Friends each thought other died in WWII"
How is it that all the Jewish children who remembered Mengele thought that he was a nice and gentle person. Is it possible that in reality he was just a good doctor and never hurt anyone he came in contact with? Any story that is based on the statement of a Jew is suspect. None of the witnesses ever confirm the stories of other witnesses but are based on their "personal" experiences. 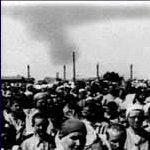 Why does it not bother main stream historians that there are so many Jewish lies circulating about the holocaust? Why does not at least one of them raise the question when the lies they can see are so obviously lies. These wild stories are in abundance and serve to reinforce the ideas of the holocaust inventors. The Kommandant of Auschwitz claimed to have exterminated 3 million Jews, yet even Yad Vashim does not claim more than one million killed there. Both numbers are lies. Hoess admitted that he would have said any number killed just to have the torturing stop. The real number of the dead in the KLs can be found in the Sterbe Buecher which are in the possession of the Red Cross. We know the Germans recorded meticuluously all deaths and punishments (even thouse which ended up in death). Why would they hide such details? In the beginning they were victorious and did not think they had to fear any retribution and at the end they did not really have time to hide their dead. 70 years after WWII ended the Jews are milkng the Holohoax Cow still. Germany thanks to such collaborators as Merkel are supplying Israel with the latest submarines to the point that now Israel has more submarines than Germany....and Merkel is still in power. Holocaust supporters with a few exceptions managed to smear all the German heroes of WWII and a rather obvious candidate for such smears was Dr. Mengele. However, slowly, ever so slowly German is waking up and when it does all Jews who returned to exploit those hapless brainwashed Germans will be skurring away to their Jewish state where they will destroy one another. According to the media Mengele was hiding in Germany under an assumed name. I heard some where this was false. Any information on this? I haven't gotten the chance to watch this yet, but it looks like a great installment. Hopefully it can go hand in hand with Mattogno's upcoming book. AntiBeliever wrote: I haven't gotten the chance to watch this yet, but it looks like a great installment. Hopefully it can go hand in hand with Mattogno's upcoming book. I suggest that you actually watch it before you comment. blacksmith wrote: How is it that all the Jewish children who remembered Mengele thought that he was a nice and gentle person. On what exactly do you base this statement ? Kindly point out to one jewish child who thought Mengele was a nice and gentle person. You say All the Jewish children said this - i challenge you to name one ! Carlo Mattogno has already written an article on Josef Mengele. This article was previously published under the title Il dottor Mengele e i gemelli di Auschwitz. Effepi, Genoa, 2008. Dr. Mengele’s alleged crimes are not proven by any document. No document shows that Mengele ever killed even one single child, or that one single child was ever killed on his orders. The essential and sole witness, the one upon whose testimony the whole accusation is based, was an extraordinarily creative impostor. Dr. Mengele’s closest collaborators, including the presumed essential witness, and at least 543 of his “victims” were allowed to live: but how, then, are we to believe seriously in the fairy tale of the “Angel of Death” of Auschwitz? To be added after the Mattogno's analysis of the Miklos Nyiszli testimony against Mengele. In consequence, the essential eyewitness testimony of Dr. Mengele’s alleged crimes at Auschwitz crumbles inexorably, and the rest of the legend along with it. There are many other witnesses , kindly do a youtube search , many of the testimonies are out there. Just finished watching the video and am not sure quite what to make of it. The only thing that stands out to me is his claim about Treblinka that it is generally accepted that no one was murdered there. Not sure where that came from and was quite a surprise to hear him make that claim. The film is well made and very professional but I don't really get to worked up about Mengele. I am fairly certain that most if not all of the claims about him are untrue. He was a wonderful gift to the holocaust movement and once they had packaged him correctly as the 'Angel of death' there was no stopping the myth momentum. No, onetruth, you are making the accusation that Mengele was a deranged mass murderer, the onus is upon he accuser, you and those like you, to support your position. Now please give us your proof and do quote so called "witnesses" in their entirety. Please tell us which trial they testified in, give us their verbatim testimony, and give us the verbatim cross examination text. Hannover wrote: the onus is upon he accuser, you and those like you, to support your position. You know perfectly well there where thousands of witnesses that saw your role model , mengele during on selections sending the weak and those found unfit to work to one side , never to be seen again. You know perfectly well that there are dozens of those twins that manage to survive that went on record. Not to manage the medical staff that survived , like Gisella Perl and others. Some of those above testified in courts some have not. Had you a real interest in the truth you would make an effort to look up their testimonies . No one is under obligation here to spoon feed you or do your dirty work for you. Myself and others have indeed cited "witnesses" and then shown how absurd their claims are. After citing shyster Gisella Perl you don't dare quote others because you know your head will be handed to you when you do. One helluva embarrassing situation for you to be in. See previous posts & read on. Time to grow up, onetruth. IOW, you cannot prove what you claim. I also assume you believe in witchcraft and sorcery where there were thousands upon thousands of "eyewitnesses, survivors , & confessions" from all over the world. 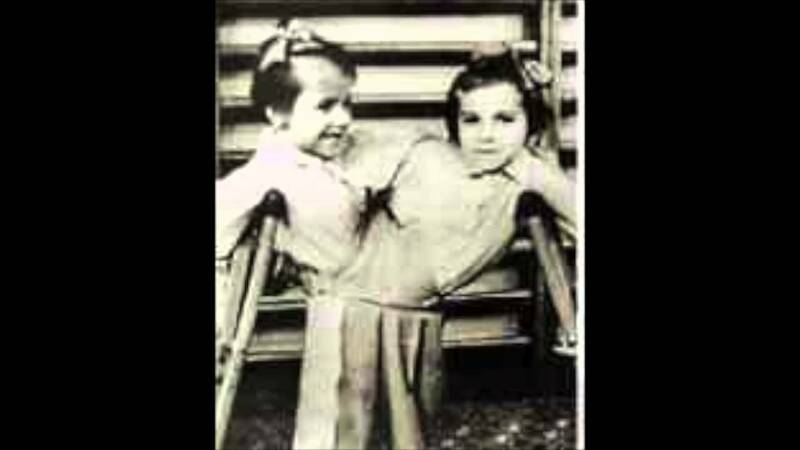 Here you go, 'photo' of Mengele's twins. Fake as can be. Only desperate liars need to use fakes. Like big, black clouds, the smoke of the crematorium hung over the camp. Sharp, red tongues of flame behind the sky, and the air was full of the nauseating smell of burning flesh." It was simply impossible for the crematorium at Auschwitz to have emitted "sharp, red tongues of flame" unless there were destructive, big time malfunction fires which would have destroyed the facility. And why don't the countless photos (including many aerial shots) of Auschwitz show us 'the big, black clouds of smoke'? - Now please give us your proof and do quote so called "witnesses" in their entirety. - Please tell us which trial they testified in, give us their verbatim testimony, and give us the verbatim cross examination text. Alone the fact that one may not question the Jewish "holocaust" and that Jewish pressure has inflicted laws on democratic societies to prevent questions—while incessant promotion and indoctrination of the same averredly incontestable ‘holocaust’ occur—gives the game away. It proves that it must be a lie. Why else would one not be allowed to question it? Because it might offend the "survivors"? Because it "dishonors the dead"? Hardly sufficient reason to outlaw discussion. No, because the exposure of this leading lie might precipitate questions about so many other lies and cause the whole ramshackle fabrication to crumble." Such is the impossible 'holocau$t' storyline. How many witnesses speaking about that prior to, let's say, 1960? Nyiszli's 1946 novel about Mengele is what kick-started the myth of Mengele's alleged ghastly experiments. This is what Mattogno and Zulu meant. Of course, they are both aware that there is today no good Holocaust story without Mengele gassing and dissecting herds of unfortunate Jews and that Mengele was a very, very busy man, amost ubiqitous, if the ramblings of today's Jewish storytellers are to be believed. And who cares about testimonies anyway? Are we hunting bigfoots or documenting Alien abductions?? ?